The questions around what prophetic art is and why you'd do it took me on a three-year journey or ‘apprenticeship’ to find out. This book is part of what I learned along the way. In the first year, I researched what it meant, which included traveling to Bethel and New Zealand seeking answers. I managed to gain some understanding of the types of prophetic art and what it means and what it isn't supposed to be. The second year focused on the practical aspects of worship art. I painted prophetically every week for 52 weeks. I refined a lot of processes and learned how to produce a reasonable image quickly, and I learned a lot about live painting, sometimes known as performance art. The third year was more about exploring the mysteries of the supernatural and the prophetic. It involved studying with Gary and Sarah Morgan's School of the Prophets. The comments in this book are from an arts background, rather than a prophetic or theological background. I believe that God wants to redeem the arts and to do this, the standard of art produced by Christians must improve to be able to be noticed in a wider arena by recognised influencers. Just as Christian music has gone from a single organ played in a dusty cavern with well-meaning reedy voices to world-famous performances such as that done by Bethel and Hillsong, prophetic art needs to continually improve so that it can justifiably compete on a world stage. This book is an attempt to shed some light on the field from an artist's perspective. I discovered Grace Bailey’s book, Painting with God, on a weekend when I was desperately praying for God to give me direction on which path to take. I have been encouraged to take my creative talents seriously and to seek how best to live a satisfying creative filled life with God at the centre. The rejection of some thought processes is still a work in progress. I’m grateful for the encouragement that I’ve received from my pastor and worship leaders to pursue the year- long project. We live in a regional town, and our brand of church is usually perceived as somewhat conservative. Having the freedom to explore worship art consistently has been an enormous privilege that has brought great release to me, both as an artist and as a prophetic voice. It’s not been without its ups and downs, and I can’t say that every single work was straight from the mouth of God. I can’t say that every work is ‘great’ or even ‘good’ art, but more on that later. I’d like to be able to say that every work is touched by the hand of God to release His power and His presence. I wish! I can say that I understand it all a bit more. In this book. Grace demystifies the process of prophetic art while sharing her journey, thoughts. and feelings. She simplifies the process with practical and spiritual applications that emerging prophetic artists can apply. We have had Grace paint at several of our worship schools over the last 3 or 4 years and have seen first hand the impact of her gift on individuals and atmospheres alike. Grace’s humility allows the Lord to minister powerfully through her art form. Her skill level is excellent and is easily seen in any of her works. Artists will be inspired and encouraged with practical tips, stories of highs and lows, and testimonies of God moving through the artist and her art. Not only does Grace talk openly about the struggles an artist faces in today's current climate, but she also proposes some great alternatives and possibilities for moving forward. A great balance between theology/life history/practical advice all seasoned with hard won experience. Back in 2009, God called me to ‘Go to the Nations and Raise Up an Army Of Artists to Reveal His Glory in the Earth”. Since that time, I’ve had the pleasure of connecting with artists around the world who share this same passion. 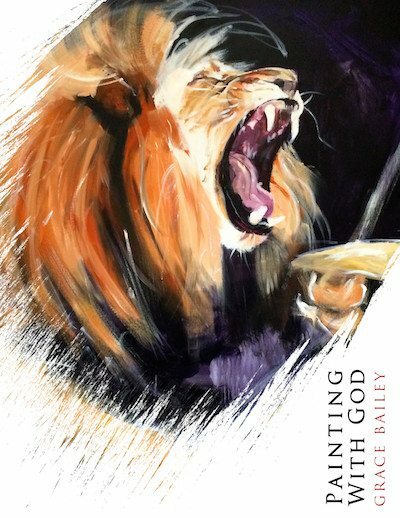 Start Your Own Prophetic Art Adventure With The 'Painting With God' EBook. You'll be guided by experienced artist, Grace Bailey, through ten colorful chapters on how to get started, face your fears and create images that tell God-stories. Explore what prophetic art is all about. Be captivated by real prophetic art stories. Be inspired to start your own prophetic art adventure.